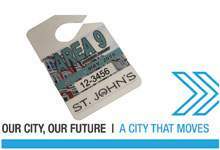 The Residential on-street Parking Permit fee will increase from $15 per year to $27.50 per year on Monday, April 1, 2019. The decision to increase the Residential Parking Permit fee was approved by council as part of Budget 2019-21 and was included in the public engagement process for Budget 2019. The increase was first presented in the Paid Parking Management Strategy in February 2018. Prior to this change the Residential Parking Permit program operated at a loss. The new fee now fully covers the administrative cost of issuing the permit.